The innovative 4800 Series 2-in-1 Vacuum Sealing System combines heat seal and handheld vacuum sealing capabilities in one unit, offering maximum convenience and versatility. It keeps food fresh up to 5x longer and saves up to $2700 per year based on buying in bulk, on sale and preventing waste. Accessory Mode Button to achieve best vacuum for canisters and accessories. Marinate Mode Button A ten minute predetermined sequence of vacuum pulse to rest ratio allowing foods to get optimum flavor infusion in the least amount of time. Vacuum Process Display Displays vacuum levels as the bag or canister is evacuated. Seal Indicator Light Constant Red light indicates sealing process is engaged. Adjustable Food Settings Button For optimal vacuuming and sealing of moist or juicy foods. CrushFree™ Instant Seal feature- Press to immediately stop the vacuum process and begin sealing the bag. This prevents crushing delicate items such as bread, cookies and pastries. Press to create a seal when making bags from a FoodSaver® Roll. Press to create a seal on mylar type bags (such as a potato chip bag) to keep food sealed air-tight. Press during PulseVac™ mode to seal bag. Roll Cutter Bar Simplifies making custom-sized bags. 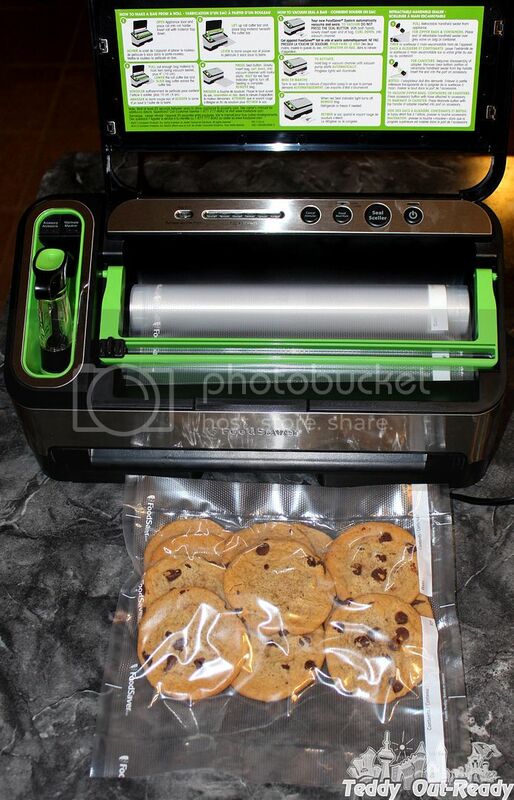 Retractable Handheld Sealer Can be used with all FoodSaver® Brand Accessories including FreshSaver® Zipper Bags. We use this Vacuum Sealing System to create bags from FoodSaver® Roll and heat seal variety of foods thanks to exclusive technology that automatically senses the bag and food type and creates a perfect air-tight seal. The biggest challenge is to estimate how big bag you need to make an item that you want to seal fit in. It takes some practice to make bags and minimize roll waste. For beginners I suggest to make them 1-2 inches bigger then you think, it will be enough and then make adjustments based on your experience. It works perfectly with fish, poultry and all types of meet. I am also using this system with FoodSaver® Zipper Bags, the handheld vacuum and Accessory mode button. It works the best with cookies, deli meats, cheese, leftovers and other refrigerated foods that you access daily. This system is must have for all people who trying to save money buying in bulk as well as for hunters and fishermen. It also will be beneficial for every household to prevent waste and get more from every dollar we spend on food. And now is giveaway time! 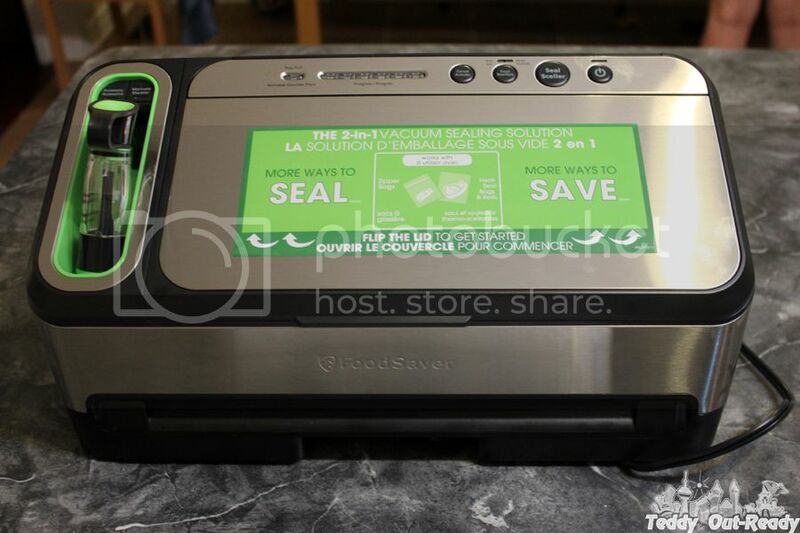 One lucky Teddy Out Ready reader is going to win FoodSaver® 2-In-1 Vacuum Sealing System, a $229.99 value! To enter to win, just fill the Rafflecopter form below. The giveaway is open to Canadian residents only and ends October 1, 2014. I wold use it for my meets and for all my fresh veggies. I would love to start some once a month cooking, so this would be a great asset! I would love this to freeze meat and veggies which I buy in bulk and prep for easy meals during the week. Looks like a great system! 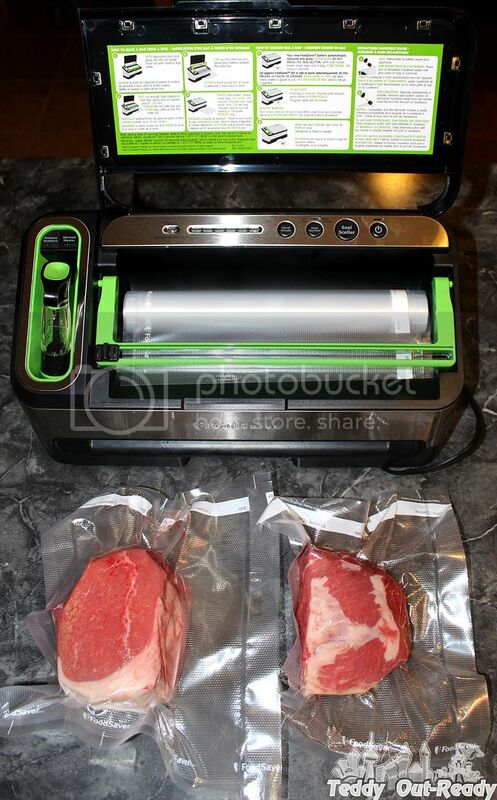 I'd use Foodsaver to package and seperate meat and berries! I would love to use it to seal our fresh caught salmon. Every year our neighbours have an annual Sausage Fest and I would love to take this with us! I always cook double or triple recipes I make in order to freeze for other meals and this would be perfect. I would use this for cheeses, meats, veggies, fruit and whatever else I could figure out to use it with! I would use it for meats! I would use it for cheese and meats. I would use it for my meats and my fresh veggies. I would use the Food Saver to seal cheese. I end up throwing away so much cheese! I would it on cheese! I would use it for veggies, fruit and portioning meat. I would use a foodsaver for meats and berries! I would use this for freezing my berries and veggies. I would use it to seal and store all the fish my husband catches this summer. I would use a Foodsaver to buy meat from warehouse stores to feed my family! There are just two of us and often food is packaged for in larger sizes, so I would use FoodSaver to separate and freeze meats, veggies, fruits and, of course, leftovers! I would use this for meats, cheeses and produce. I would use it for meats and cheese. I'd use the FoodSaver for left overs and cheese. I would use it for meats, cheese, berries and to portion out meals. 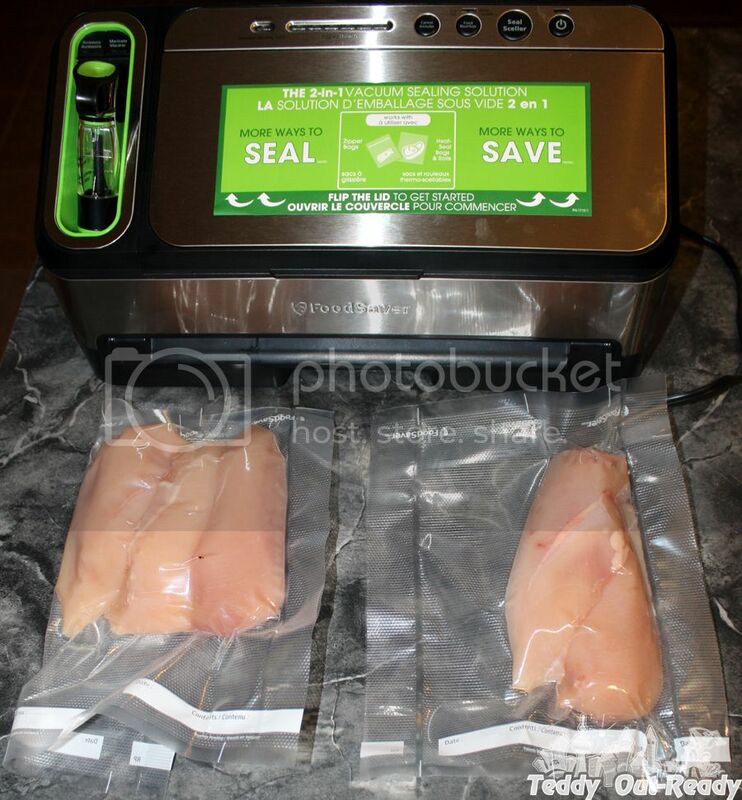 I would use this to replace the freezer bags I currently use to freeze my smaller portions of chicken and steak. I would use it to seal my meats, berries, veggies and cheese. I would use it for cheese. I would use it to freeze meats when they are on sale and fish my husband catches. I would use it to freeze meat and veggies from our garden! I would use it to freeze my meats, cheeses, fruits and vegetables that I buy in bulk. I would use it for freezing smaller pack of meat. 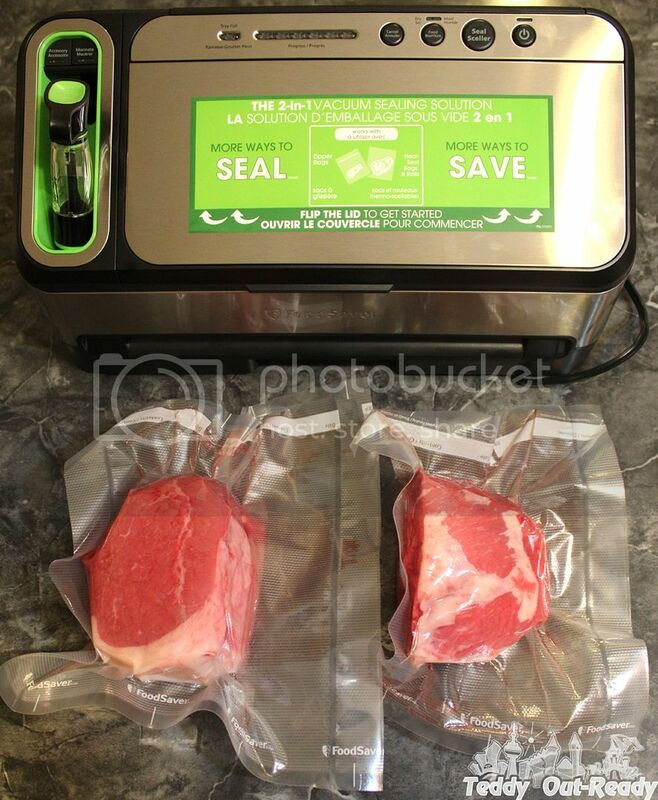 I'd use the foodsaver for freezing meat. Bailey dexter I would love to use the foodsaver for all my veggies that I grown in the garden! I'm a single guy - having variety without most of it spoiling is hard. So I'd use it for everything!!! It would certainly make taking leftovers out on the road a lot easier! I would use it to store stew and other crock pot meals for the week. My father in law will also benefit because I would be able to make him meals in advance! I would use it to seperate our meats and freeze. I would use it for freezing meats. I would use it for our meats .. we buy in bulk and separate when we put in the freezer so we can pull one meal out at a time. And I would use it for our garden veggies. 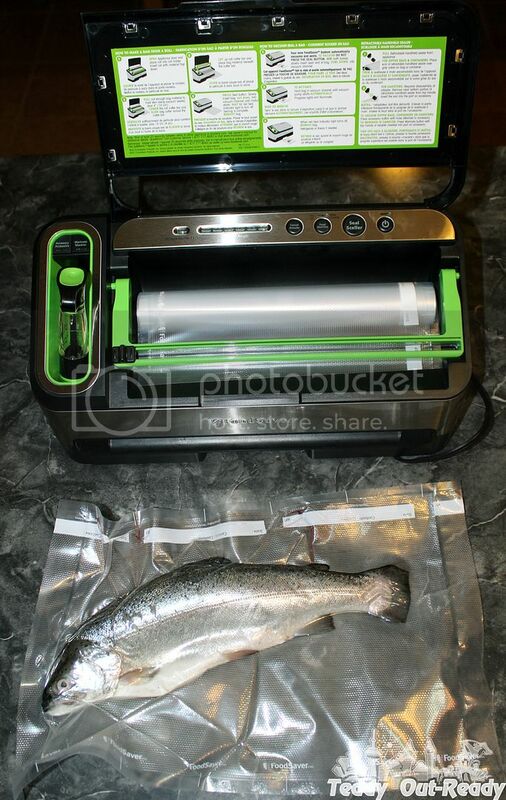 It would be great to win a FoodSaver 2-In-1 Vacuum Sealing System. What would you use a FoodSaver for? I would use it for my meat and vegetables. Thank you for having this giveaway!!!!!!!!!! !